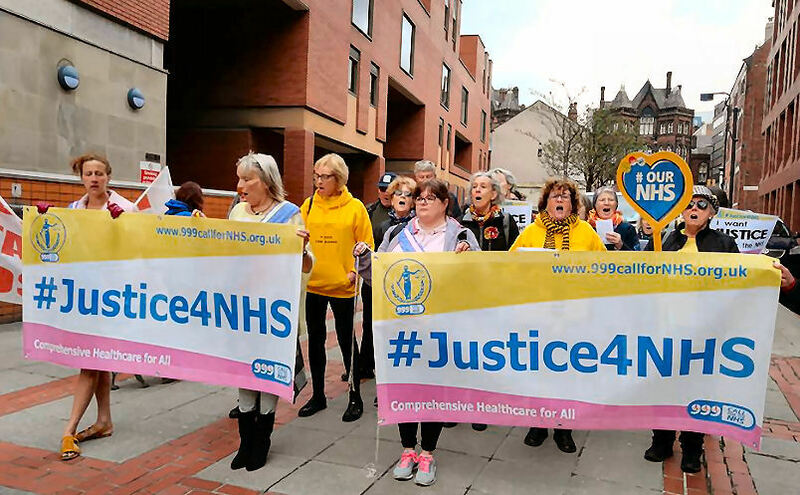 Campaign group '999 Call for the NHS' were in Leeds High Court on 24th April for the hearing of the Judicial Review of NHS England’s contentious Accountable Care Organisation (ACO) contract. The challenge was that the contract’s introduction of a new payment mechanism is unlawful under current NHS and social care legislation and national tariff rules. 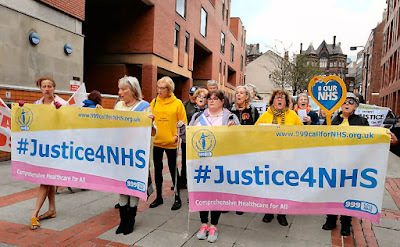 Thanks to everyone who signed the petition to stop the dismantling of the NHS and thank you if you made it to Leeds for the first Judicial Review on Tuesday 24th April . If you couldn't get there, here are a few highlights. This Judicial Review marked the first of the legal challenges to the change from a National Health Service, to a Neighbourhood Health Service, (Simon Stevens' words I'm told), where the possibilities for postcode lotteries are magnified hugely and £22bn is being cut from the funding that would otherwise have been allocated by the Treasury by 2020. 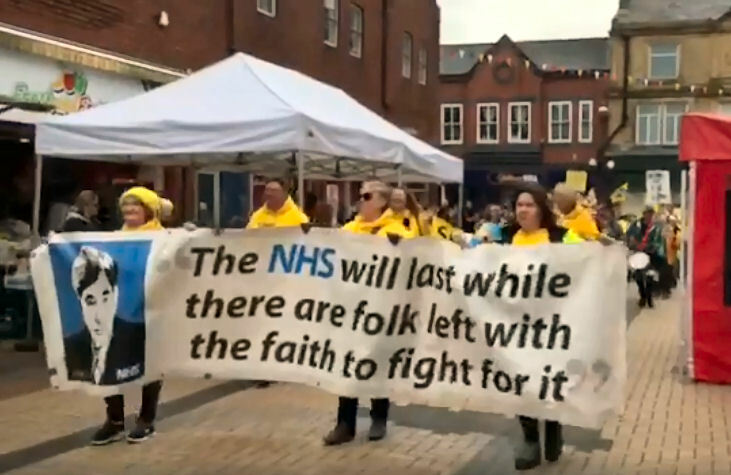 Campaign groups from Chorley, Darlington, Dewsbury, Grantham, Huddersfield, Leeds, Manchester, Slaithwaite, Stafford, and Oxford, to name but a few, plus concerned individuals, gathered outside the court for the rally and some went into court afterwards. We were all lifted in spirits by the wonderful choir. The Slaithwaite story was of a success, showing that together we CAN make a difference. There were more contributions than we can include here and thank you to all who sent stories and messages of support which were read out at the start. Other stories are in the links...a speaker from where 999 Call for the NHS started, in Darlington, a Consultant from Leeds, and the struggle in Oxford. Now we wait for the ruling. Find out more about the day in court here. This is a huge challenge but together we ARE making a difference. We must fight for the NHS as a comprehensive service for all. Nobody will do it for us. Thanks for your part in this. We couldn't do it without you. 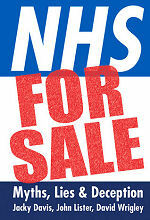 Over at Nottingham’s so called ‘health economy’ there's another struggle going on out of National public view. The Clinical Commissioning Group (CCG) have contracted a private provider to run The Circle Nottingham Treatment Centre which employs over 150 experienced consultants and performs diagnostics and treats cancer as well as other illnesses. The new STP arrangements everywhere in England, renamed Integrated Care Organisations and Systems are having to make cuts and Nottingham is no different. So now the CCG wants to procure the contract for less money. It is on the cards that the private, for-profit company, most famous for handing back the contract for Hinchingbrook Hospital and owned by Toscafund , will sue the CCG. How can that be fair? What are the odds they’ll win? This is hot on the heels of the undisclosed sum awarded out of court to Virgin when it challenged NHS England 6 CCGs and the Council, in the Surrey ‘health economy’. The odds are seemingly, not stacked in NHS hospitals favour, because they are doing more work than they are being paid for. The harsh ‘control totals’ ie permitted spending amount, do not provide enough money to do the job, so they can’t save or ‘increase efficiency’ . Then they are penalised, for not hitting A&E targets for example and previously promised 'Transformation' money withdrawn. The relentless move to close hospitals goes on. We’ve just found out about South Tyneside’s Save our Hospital campaign, which needs help on crowdjustice. 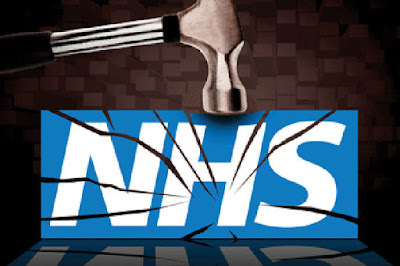 As Jeremy Hunt says, he wants to re-direct NHS services by suspending tariffs . It doesn’t really matter what the name is, the plan is the same. STP Integrated Care Systems will mean ‘managed care’ ie less care, fewer services, fewer medics. We are fighting this with every bit of our strength because it is ideologically driven and completely unnecessary! Stay updated by clicking to recieve updates. You can unsubscribe later. Article from 38degrees "STOP the New Plans to Dismantle Our NHS"
Chorley & South Ribble NHS campaigners marched through Chorley town centre today to mark two years since the A&E at Chorley was closed. Protesters today accompanied by a Samba drum band marched all the way from Chorley & South Ribble district hospital to Chorley town centre. 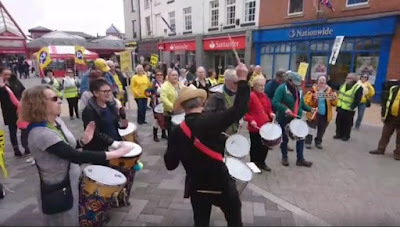 The demonstration, fronted by the samba drum band 'Sambafriq' comes only a few weeks after protesters marked the 100th week of protests since the A&E was closed in April 2016. The previous demonstration on March the 10th marked the 100th week of protests since the A&E closed. 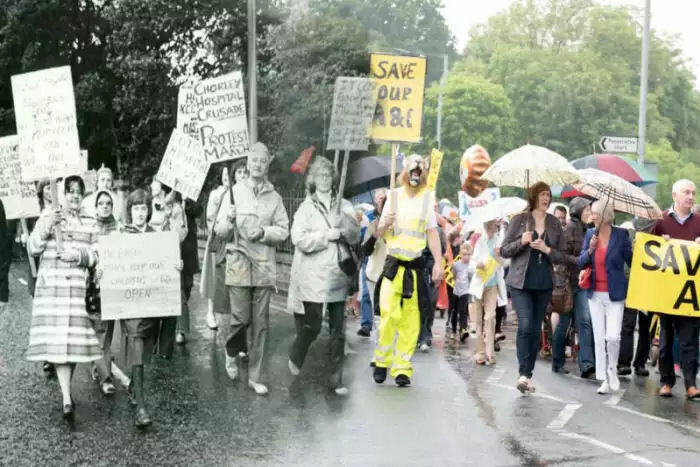 It also coincided with the anniversary of a rally back in March 1975, when hundreds of people marched to call for a 24/7 casualty service for the district. 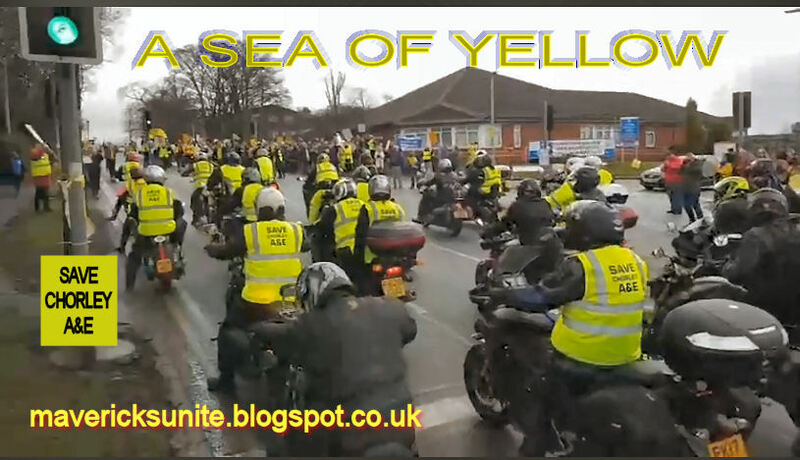 The demo in March drew bikers from all over the county who came out in force to support A&E campaigners who created a chain of supporters from Preston Road to Euxton Lane entrances. The A&E department was closed in April 2016 with the hospital trust board blaming a shortage of staff but was reopened in January 2017 part-time (8am-8pm) after pressure from campaigners, the local MP and councillors. Fired by a sense of injustice, campaigners have since gathered outside the hospital on Euxton Lane every Saturday morning from 10am to 11am to campaign against the closure of the A&E unit. But campaigners are as adamant as ever to get the A&E reinstated full-time and have vowed to 'remain on the gate' at the hospital until the A&E is reinstated full-time. Our Chorley & South Ribble NHS campaign organisers are currently looking for volunteers to help out with organising events and other activities. You don't need any special skills, just the will and determination to help out where you can. If you want to help out feel free to join our facebook forum (link below) and leave a message. Alternatively use the Contact form above top left of this page.